Seniors Sean Maguire and captain Matt Grzelcyk and freshman Jakob Forsbacka Karlsson were named to the Hockey East top performers’ list. 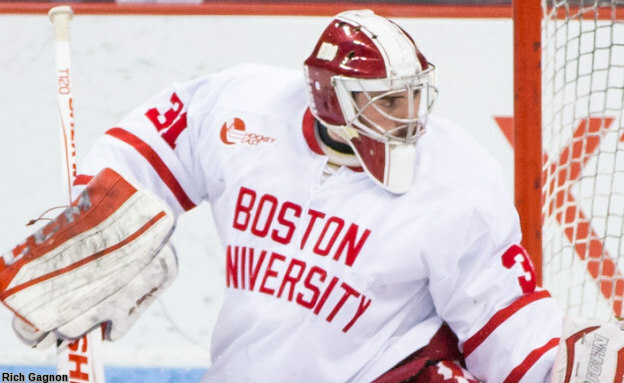 Terriers dropped from #10 to #11 in both the USCHO and USA Today/USA Hockey Magazine polls. There were certainly some very positive signs for David Quinn's group, namely the stellar play from senior goaltender Sean Maguire. The Pittsburgh Penguins draft pick made 70 saves on 75 shots on the weekend, but several were of the jaw dropping variety. Before allowing the goal late in Saturday's contest, he was absolutely spectacular to keep the Eagles off the scoreboard. UPDATE: NHL Central Scouting today announced its 2016 midterm rankings, which feature one current Terrier and five BU recruits on its list of North American skaters: #8 Clayton Keller, #9 Charlie McAvoy, #12 Kieffer Bellows (photo), #18 Dante Fabbro, #30 Chad Krys and #146 Patrick Harper. 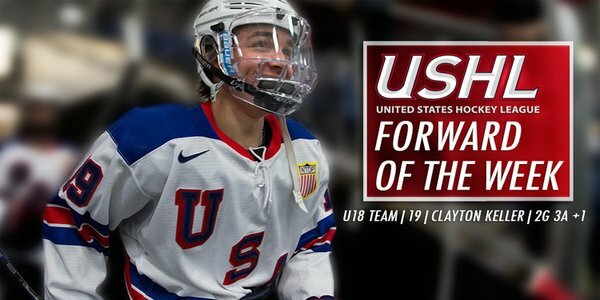 Five points in two games (3G, 2A) earned 2016 recruit Clayton Keller the USHL Forward of the Week honors. The left-shot center had four points on Friday and scored his fifth game-winner of the season on Saturday, bringing his points total to 68 (23G, 45A) in 35 games. 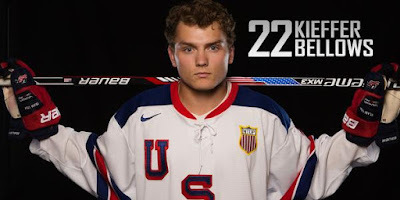 2016 recruit Kieffer Bellows scored his team-leading 27th goal in the NTDP U18s’ 3-2 win against Youngstown on Monday. Last season, the Edina, Minnesota native rang up 33 goals in 58 games for USHL Sioux Falls. 2017 recruit David Farrance (photo) scored a power play and an assist for the NTDP U17s, who dropped a 5-4 overtime decision to Muskegon. 2018 recruit Logan Cockerill assisted on Farrance’s goal. 2018 recruit Tyler Weiss scored a goal with 47 seconds left in regulation to give Don Mills Flyers a 2-2 tie with the Markham Majors. Weiss has a 17-15-32 scoring line in 22 games. Jack Eichel scored the Sabres’ first goal and assisted on the game-winner, both on power plays, in a 2-1 victory over the Coyotes. The former All American and Terrier MVP, who earned first-star honors (and third-star for the NHL on Monday evening), now has 14 goals and 15 assists in 29 games. 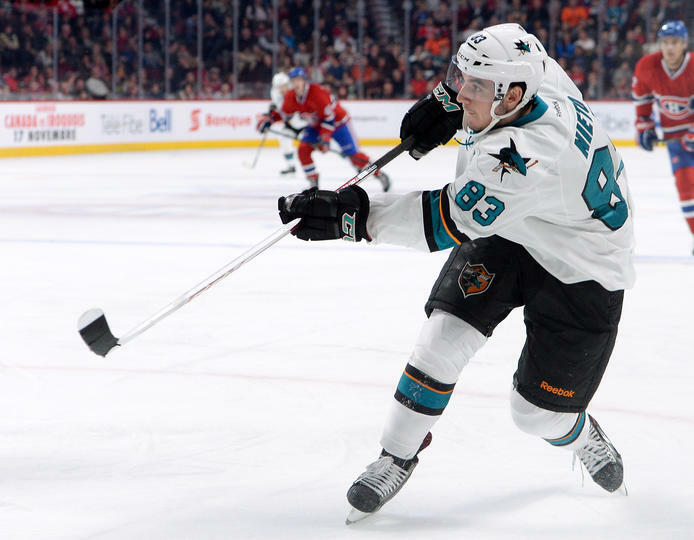 Matt Nieto scored his sixth goal of the season for San Jose, but the Sharks dropped a 4-3 decision to Ottawa in a shootout. Nieto earned second-star honors. Freshman Sammy Davis’ hat trick led the Terriers to a 6-2 win at Vermont on Sunday, enabling BU to take three out of four points in the two games with the Catamounts. BU also received goals from senior Dakota Woodworth and juniors Alexis Crossley and Samantha Sutherland. 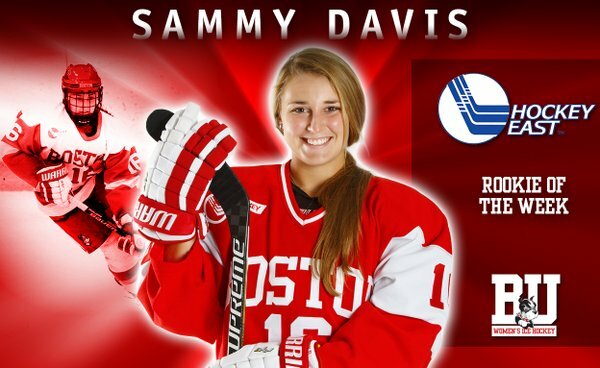 Davis was named Hockey East Rookie of the Week for the second time this season and is second in the conference in goals (11) scored among freshmen. Sutherland and Lillian Ribeirinha-Braga were named to the weekly top performers list.